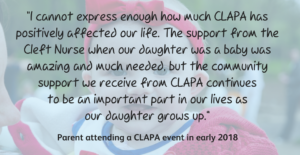 Make a donation today to help CLAPA continue to provide vital services for families affected by cleft lip and palate. Thank you so much for making a donation for CLAPA! As we recieved very limited statutory funding, we are reliant on support from our community, so every donation is hugely appreciated! Can’t see the donation box above? Visit CLAPA’s Just Giving site to make a donation. You can also set up a Direct Debit to keep CLAPA going month after month. If you would like to pay in money from your fundraising event, please click here to see the wide variety of ways you can make your donation. Please send a cheque made payable to ‘CLAPA’ with any sponsorship forms you may have to our address (see below). Try and make sure that as many of the sponsors as possible have filled in their surname, house number, postcode and ticked the gift aid column. Alternatively you can make an online BACS transfer or pay cash or cheques directly into any Barclays Bank and add your name as reference. In order to pay cash directly into our bank account, you will need a pre- printed paying-in slip. If you do not have one of these, please email [email protected] to request one. Please provide a copy of the ‘Counterfoil’ paying in slip once the transaction is complete. Please remember to contact us and let us know the date and amount of the deposit so that we know to attribute the sum to you. Please call the fundraising team on 020 7833 4883 or email [email protected]. We’ll send a thank you as soon as we’ve received your donation or sponsorship. Thank you so much for choosing to support CLAPA. Want to make a direct donation or set up a Direct Debit? Head to our Just Giving page!